2-3 pkgs Country Style Boneless Pork Ribs- depending on mouths to feed, and size of your Crockpot. *Tip: Choose ribs with a nice amount of fat. If you choose country style ribs that are really lean they end up dry. The fat helps them be really moist. 1. Layer pork ribs in Crockpot and as you layer them, season them with salt, pepper, garlic powder and onions. 3. Cook ribs on high in Crockpot for 4-5 hours or low for 6-8 until very tender when poked with a fork. They should be falling apart. Check periodically and move them around so they all get cooked well. 4. 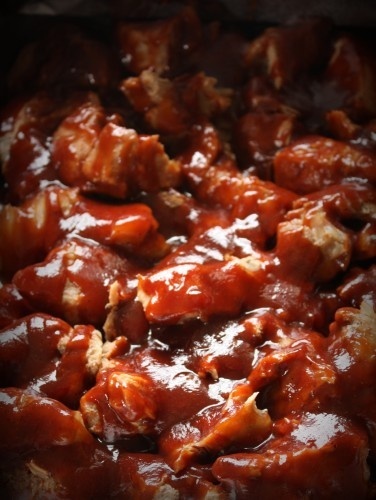 Remove ribs from all the fat and juice within the Crockpot and place in an un-greased baking pan. I leave behind any big pieces of fat that have fallen off the meat. 5. Pour BBQ sauce over ribs till they are generously covered. 6. Bake covered at @375 for about 30 min or until sauce has had a chance to heat and saturate the meat.